Home decor and design magazines always share such beautiful kitchens. They are way out of my budget though – I can’t spend $18,000 for 2 handmade custom cabinets made with trees from some weird place I’ve never heard of. 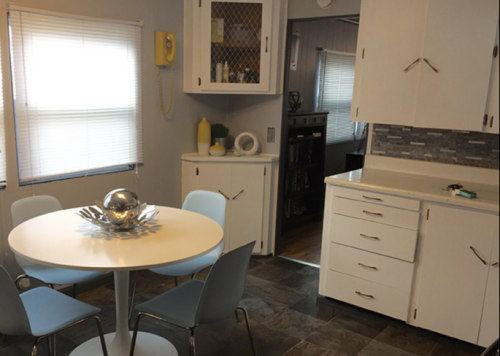 I can, however, create a beautiful kitchen using a little elbow grease and creativity to update mobile home kitchen cabinets, just like the following homeowners did. Paint is the most affordable and dramatic way to update any home. It’s really neat to see how a room can change with a single gallon of paint. Paint works just as well on mobile home kitchen cabinets. 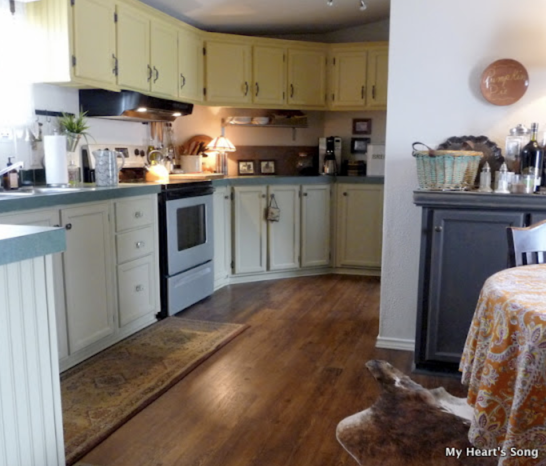 One of the best mobile home kitchen makeovers is Geneva’s over at My Heart’s Song blog. 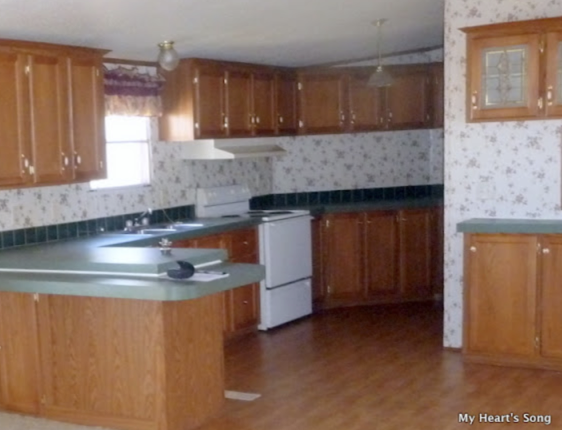 Her before and after photos shows the power of painting your kitchen cabinets. Geneva’s kitchen before her gorgeous makeover. Geneva’s kitchen after she painted the cabinets and knobs (and a few other things). It’s surprising how new hardware can update mobile home kitchen cabinets. We’ve all seen the round flowered knobs they use in most mobile homes. Replacing those will instantly update your kitchen. This single wide got a complete makeover for $500, and that was for the whole house! This retro single wide kitchen makeover included cool cabinets handles and pulls. If primitive or country farmhouse is your favorite style we have a few creative ideas to update mobile home kitchen cabinets. 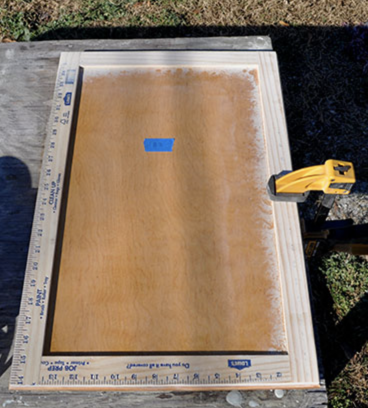 Finding old cabinet doors with broken glass (or a damaged middle section) at your local resale shop or Craigslist isn’t as hard as you’d think. You’ll just need to choose doors with a good frame. I’ve seen some homeowners cut out their own cabinets and add framing around the edges, too. After the middle is removed, staple chicken wire to the back of the frame. This trick definitely adds a primitive country farmhouse look to the kitchen. 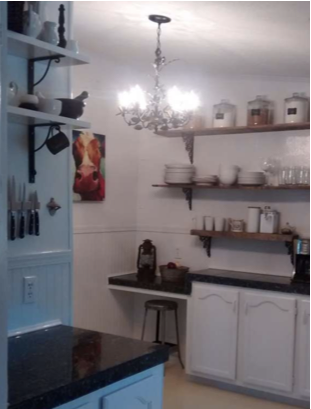 The finished primitive style kitchen with chicken wire cabinets. 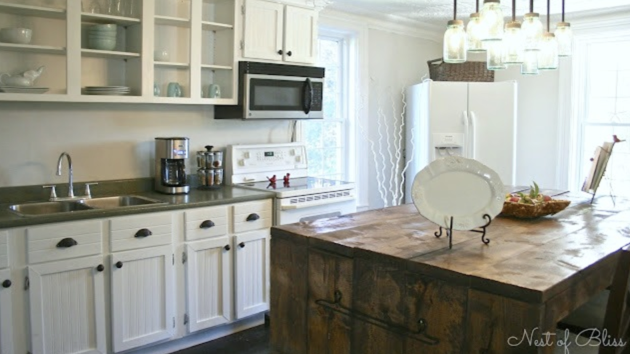 We love this mobile home that got a rustic farmhouse kitchen makeover! Adding beadboard wallpaper to the center section of the cabinets. Glue beadboard paper over your cabinet doors and then attach trim around the edges. 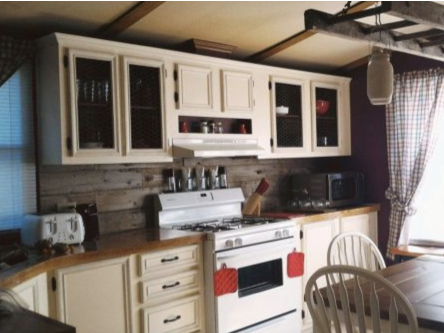 Paint the cabinets to match your rustic kitchen. Boom! Beautiful kitchen! Dimensional Beadboard paper is easy to work with. The kitchen after the beadboard wallpaper was installed. Adding shelves is a great way to update your kitchen. If beadboard isn’t your style you can still add dimension to your kitchen cabinets. An affordable way to add trim is with Lowe’s rulers. Yep, those wooden rulers that they give away! 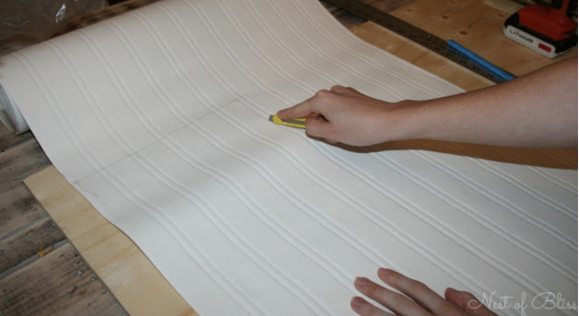 Using free construction rulers is a great way to add interest to your cabinets. Adding chalk paint or cork to your kitchen cabinets creates a handy family center. We hope these tips help you update mobile home kitchen cabinets. There are so many great ways to make your home beautiful and without having to spend your kid’s college tuition fund. 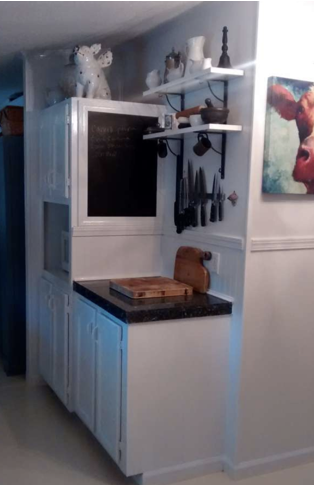 If you are still looking for inspiration this affordable mobile home kitchen remodel can help! Have a look you want to share? Email us or comment below. We would love to hear about it. Would like to know how you fill in the wood paneling groves to make it flat walls for painting over? I have exactly what you need on this article, How to Update Vinyl Walls in Mobile Homes. It’s not a hard project but it will take some practice and testing to find your best technique. Best of luck! Oh my, the ruler is a great idea!! I’ll have to get some for my cabinets until I can afford to build new ones.